Not even one game into the final stretch of the season after the All-Star Break, the Philadelphia Flyers had to make a move that sent a shiver down Broad Street. Elliott was signed to a two-year deal last offseason to be the Flyers’ No. 1 goaltender. He was expected to be an average goalie who would keep the team competitive for two seasons. With Lyon and Carter Hart playing in the AHL and WHL, respectively, the team needed to bide their time before solidifying the goalie position for the future. Elliott has made it an exciting interim by playing above expectations this season. The workhorse for the Orange and Black has started 37 of the Flyers’ 49 games, posting a 19-11-7 record. He has over 1000 saves this season with a .908 save percentage with a 2.77 GAA at the time of his injury; not the best numbers in the league but enough to keep his team in games. When you have Claude Giroux, Sean Couturier, Jacob Voracek, and Shayne Gostisbehere playing in front of you, you can afford to miss a save or two. The most pleasing part of Elliott’s game is his consistency. 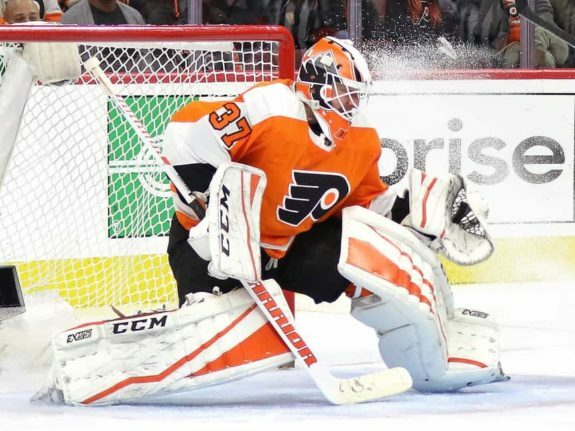 The Flyers have several areas of concern this season, but goaltending is not one of them: Elliott is going to be in net for the Flyers and he is going to give up a couple goals but he is also going to give them a chance to win. Sometimes he surprises you with a sensational game like the one he had in Washington on January 21st. Facing one of the best teams in hockey, Elliott was a brick wall making miraculous saves while allowing just one goal to the league’s best scorer. The Flyers won the game 2-1 in overtime. The team was winning games with Elliott and were in a playoff position at the end of January. Now he is on the IR for who knows how long and the fans’ confidence is shaken. A playoff berth has gone, for many, from a strong possibility to an optimistic sentiment. Now the Flyers will have to win with Neuvirth and Lyons. 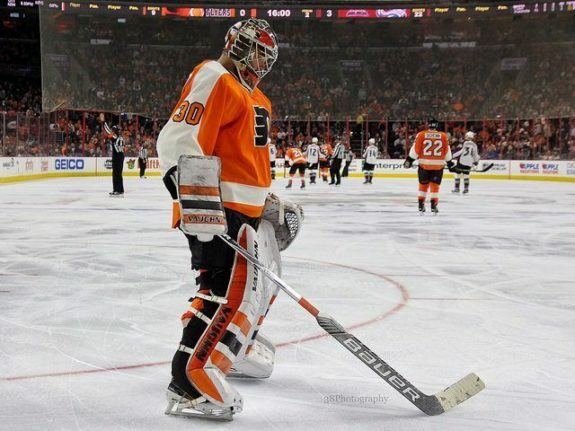 It’s up to Neuvirth to lead the Flyers to the promised land. Hold in your laughter. There is no punchline because for the foreseeable future it’s true. Hold back your tears. It isn’t doomsday in Philly. Neuvirth is replacing an average Elliott. He isn’t replacing Andrei Vasilevskiy or Sergei Bobrovsky or even Michael Smith, who is the reason the Calgary Flames are in the playoff hunt. As long as Neuvirth can be average, the Flyers should be fine. “The worst is behind me,” Neuvirth said at practice on Tuesday after being told he will start on Wednesday against the Washington Capitals. This is good news if true because his numbers have been better than Elliott’s this season, albeit in far fewer games. In 12 starts he has a 2.46 GAA, a .918 Sv% and a shutout to his credit, something his partner has not been able to do this year. For his career, his numbers are respectable at 2.66 GAA and .912 Sv%. In 2015-16, his first year with the Flyers, he started 29 games with an 18-8-4 record, 2.27 GAA and a .924 Sv%. The leading goaltender that year was Steve Mason who had similar numbers to Elliott and the Flyers made the playoffs. 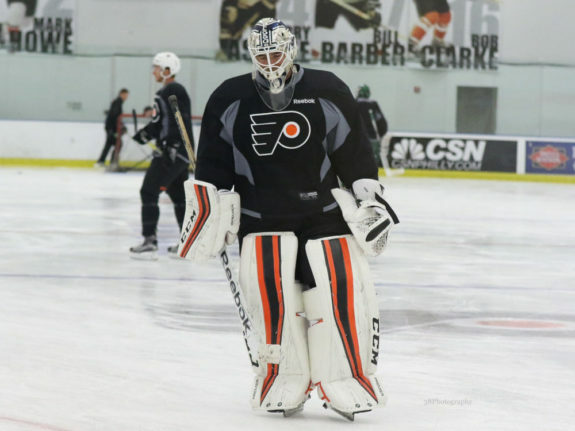 Now, there is at least one problem with Neuvirth and that is his health. He has already missed several games this season due to injury and illness including an 11-game absence in December with a leg injury. One more serious injury while Elliott is on the IR and the Flyers could be looking at a rookie goaltender between the pipes. It’ll be shocking if Lyon doesn’t get a start while Elliot is out. The Flyers begin the post-All-Star Break schedule with back-to-back games against the Capitals in Washington and the Devils in New Jersey; two division rivals that make winning these games that much more important. Do the Flyers risk sending out a fragile and unseasoned backup to face two explosive offensives on back-to-back nights? Even Neuvirth was hesitant when asked about potentially playing both games: “Let’s just focus on tomorrow first. It’s a big game against a really good team, so let’s just focus on tomorrow,” he said. This could mean that Lyon will make his NHL debut soon. He has been with the team for 10 games this season but has yet to leave the bench. In Lehigh Valley he has started 24 games, has a 13-8-2 record, a 2.90 GAA and a .910 Sv%. It is uncertain how long Elliott will be out, but it makes sense to believe that Lyons will get his first NHL start against the Devils on Feb. 1. It’s a good attitude to have for a young goalie. The Flyers could be looking at a very interesting situation over the next few months. How long will Elliott be on the IR? Will he be successful if and when he returns? Can Neuvirth hold up against the pressure of being a No. 1 goaltender? Will Lyon prove that he is a franchise goalie in the making? Let’s see how they play against the Capitals and Devils.